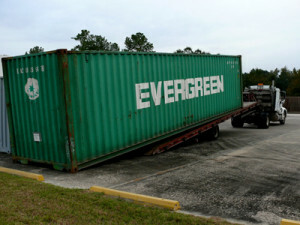 Do you need us to deliver your container? 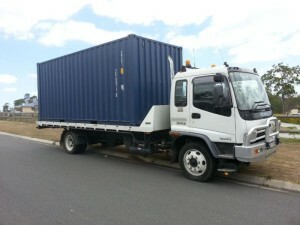 No problem, Quality Containers has a network of qualified third party transporters that we would be happy to connect you with. We will even take care of all the details to arrange your shipment for you. Don’t worry about not having off-loading equipment at your site. Our drivers use a specialized tilt back trailer to offload your container and slide it into place where you need it on your property. Make sure your site is suitable for access by a heavy vehicle. The drop site & access to the drop site should be free of obstacles that could damage the truck & should be dry, compacted surfaces. The tilt bed style trucks we use for delivery are for your convenience. 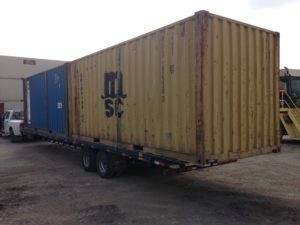 They require 100′ in front of where the container will be placed, 12′ in width, and 14′ in height so that the truck has adequate room to tilt the bed of the truck & pull forward to leave your container in place. If you order a 20′ container, special requests can usually be accommodated for a smaller truck with slightly different space requirements. The drop site for your container(s) should be level. This is an important factor in ensuring the doors will function properly. Railroad ties, cinderblocks, or gravel are most commonly used to keep the four corner posts of the container level. If necessary, attain any & all required permits or be aware of any restrictions within your municipality prior to delivery.